Go to INFO FOR MEMBERS for fees & more details! Times & Fees may be subject to slight changes to accommodate the site, the Instructor or Student interests. When you think of Irish Dancing, you see the fancy dresses, arms down and feet flying! Step Dancing explores discipline, patterns, grace and tradition. It's also a fantastic workout! The Dancer is inspired by jigs, reels, hornpipes and slipjigs. 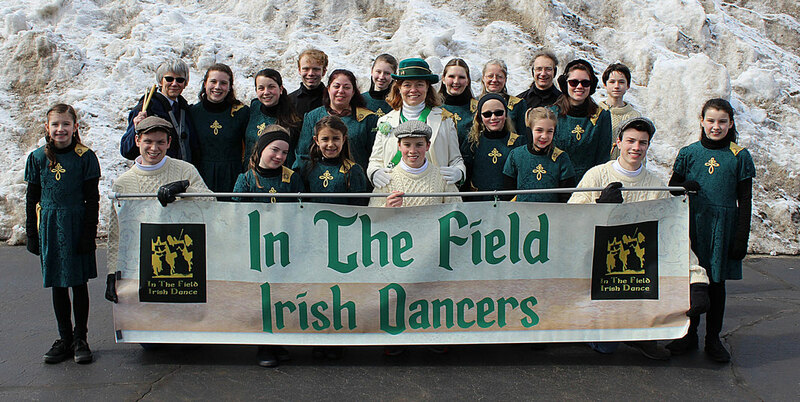 Ceili Dancing is similar to Folkdancing but with an Irish Flair! 2-3-4-6-8 even 16 people make up the dances. It's still reels, jigs, marches and hornpipes . . . . and you use some armwork! Lots of fun. You may even recognize some American Dances or others that are similar. We are a non-competitive DanceGroup offering fun, exercise, discipline, performances, culture, respect,growth and more fun. We do not have wigs or $1000 dresses. This global phenomenon crosses all borders and ages but is a little more popular with Adults. While more informal and the Dancer is off their toes, one can set their own pace as a form of exercise - and you won't even realize it! Sets are the descendants of the French Quadrilles and the Ancestor of American Square Dancing with wonderful patterns and fun footwork. Always 4 couples in a square. No partner? Don't worry. There are plenty of us around. Add Slides and Polkas to the regular repertoire of music.